The Fool is like the Joker in an original set of playing cards. But in the tarot it has a very special meaning, all about new starts. The Fool is the innocent, a young man starting out in life. He is on a journey and does not yet know what lies ahead. He is a courageous seeker, living in the moment. However, moments have a way of moving on, or making way for new moments. And he must deal with whatever is in his path. However, he is usually an optimistic character (note the golden sun in the background) and can see opportunities even in situations that might, to others, seem quite negative. 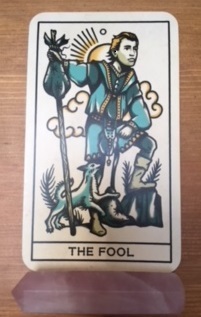 The Fool presents us with that lesson then: to be able to live in the now and see what opportunity is presented, even when they include clouds! The Fool has a dog with him - a friendly and protective companion. In reality we may or may not have pets around us. But we could well have friends close by, who will give us support and comfort. They may enjoy the journey with us and make it better for us, too. The companion may also be an invisible figure to other people, but strong in our imagination or awareness - perhaps a higher power, an angel or spirit guide. So we might think we are alone, but really we are not - there is a positive force around us. At least this is the message of the Innocent that is the Fool, and that stands for the kind and open side of human nature. From that side we have only good intentions and we work from the heart centre. If we have too much of a strategy or attempt at manipulation going on, we may not find the same level of support available. In a way, the Fool helps to guide us to the right place, if we can hear its message. For me, personally, this card is coinciding with lots of new ventures. Some of them relate to work, others are to do with lifestyle. Either way, there is an injection of new energy, which is enlivening and refreshing. Even where there seem to be some challenges, I can see opportunities! I think it's time to say thank you to the Tattoo Tarot for showing me this card today!